Of course, the first thing we all notice when we hear Sia's music is her voice. She has a rougher style compared to most pop stars, and with that massive range, she breaks the mold and is easily recognizable. In fact, she has one of the best voices for conveying emotions - she's right up there with Bjork and Amy Lee, who I've always considered the heads of that department. It's easy to marvel at some of the emotions she conveys on this album, and really, it's easy to appreciate the music in general. I may have discovered the wonder of 1000 Forms of Fear in the winter, but I imagine I'll be playing it frequently when summer rolls around. "Chandelier" opens 1000 Forms of Fear in a very bombastic way. It's loud... Sia's voice soars in the chorus, hitting bold notes in a heartfelt way. There's a sense of restlessness and a tinge of hopeless throughout even as the instrumentation of the chorus invokes a sensation of climbing (that's the best way I can describe it; I realize that probably makes no sense), but here's also some urgency in the post-chorus: "'Cause I'm just holding on for tonight." The line repeats at the end as all the electronic elements fade away and leave Sia with just the piano and strings. It's definitely the album's most 'pop' sounding song overall with its heavier reliance on synths, and I even dare to declare it a masterpiece of pop music. One of the other songs that many already know is "Elastic Heart," for it appeared on the Hunger Games: Catching Fire Original Motion Picture Soundtrack in a collaborative format. It's easy to see why this song would appeal a large amount of people with its mellow electronic feel and great lyrics: "I've got thick skin and an elastic heart / But your blade, it might be too sharp." But the characteristic of this song that caught my attention right away is the really weird synthesized/vocal thing happening in the background throughout. It's pretty awesome. Something similar happens at the end of the first chorus of "Free the Animal." The lesser-known tracks are also special in their own ways. 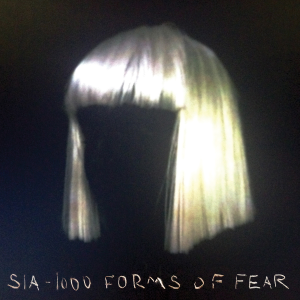 While Sia is most popular for her larger-scale electronic productions like "Titanium" (which was done with David Guetta) and "Chandelier," the woman writes some seriously solid ballads too that don't include many synths at all, and I found them to be some of the best parts of 1000 Forms of Fear. "Big Girls Cry" (the second single) has a strong chorus, it feels like a declaration, and the lyrics focus on the inevitability of emotions and vulnerability, something every human being can relate to. Still, one of her biggest accomplishments is "Cellophane," which quite dark and has fantastic lyrics: "Can't you see I'm wrapped in cellophane? / Watch the blood pump through my veins / Electricity floods my brain." A brooding guitar line reminds me of Pink Floyd and throughout the song there's this thumping pulse that Sia and all the other instruments fill in around. The middle eight is gorgeous, with Sia vocalizing and a series of simplistic piano chords. "Eye of the Needle" has a few interesting things happening musically. There are lots of echoey effects and sustained piano chords, and something about the instrumentation in the chorus reminds me of Lana Del Rey, and I like that. "Straight for the Knife" also managed to remind me of Lana both musically and lyrically: "You went straight for the knife, and I prepared to die [...] You wonder why you make girls cry." It's a melancholy song, but the lazy piano melody recalls summertime. In fact, the instrumental of the chorus reminds me of Pink Floyd, and I listen to them every summer alongside Lana. But there are also some fun moments, particularly in the form of "Hostage." It's another song that's perfect for summer, but in a different way than the other more brooding tracks. "Hostage" has a carefree feel that makes me smile every time I here; it's so chilled out and kind of quirky. The middle eight of "Fair Game" also has this quirky quality despite that the song otherwise feels rather serious to me, and this track is overall quite interesting to me. I just really understand it for some reason. Altogether, 1000 Forms of Fear really impressed and surprised me with the exception of three songs ("Burn the Pages," "Feed the Animal," and "Dressed in Black"... they just didn't excite me). The majority of the songs resonated with me in some way or another. Sia definitely knows how to write AND sing, but that doesn't really surprise me... What surprises me is that when I finished listening, I didn't feel like I just heard a pop album. Some of it feels more like fluffier alternative or like the pop music of the early 2000s, with more focus on guitars and piano than what one may expect, especially if he or she has only heard songs like "Chandelier." I actually think a lot of people who don't generally like today's pop music very much will be able to appreciate this album. It has a little bit of crossover appeal, and at the end of the day, it's just a job well done.